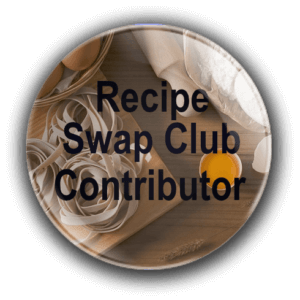 We are so excited to have our first recipe swap assignment for Recipe Swap Club! 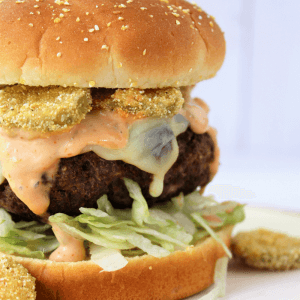 We got tasked to reproduce a recipe from fellow Recipe Swap Club member, Berly’s Kitchen and it was so hard to pick one because all of the recipes on this website look absolutely amazing. Good news though! We did pick one and went with Berly’s Kitchen Cinnamon Rolls. I think we picked well. These cinnamon rolls turned out gooey and sweet and everything you expect from a great homemade cinnamon roll. We only made one change to the recipe, which was to use a little less cinnamon than recommended because we aren’t huge cinnamon fans and they turned out perfectly. Gather ingredients, pan ( we used a pie pan today), mixing bowls, whisk, measuring cups and spoons, kitchen utensils, stand mixer with dough attachment, rolling pin, and dental floss. I will explain the floss later. Mix 2 1/2 cups of flour, 3 tablespoons of sugar, teaspoon salt, and packet of yeast until well combined. Set to the side. Heat water, milk, and butter. Berly's Kitchen recommends heating to 115 degrees. Add water, milk, and butter mixture to dry ingredients and add egg. Put the mixture into a stand mixer bowl with the dough attachment. Mix for 6 minutes. Check dough every so often to add a pinch of flour if getting too thin. Remove from mixture, let rest for 2 hours if using a normal yeast or 10 minutes if using the instant packet of yeast. Dough is done rising when you can put a finger in and it does not try to retain it's shape. Use a rolling pin to roll dough into a rectangular shape. Spread 3 tablespoons of softened butter on the rectangle of dough. Sprinkle evenly with 2 tablespoons of cinnamon and 1/2 cup brown sugar. (Berly's Kitchen original recipe recommends 4-5 tablespoons cinnamon). 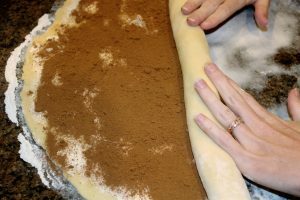 Roll the dough so the cinnamon and sugar are on the inside. Grab the dental floss. 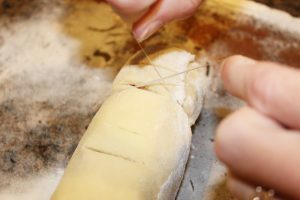 Mark the rolled dough into 10-12 even pieces and use the floss to slice through the dough. There is a picture above of this, you will just wrap the floss around the marked spot, twist floss and pull tightly for a nice even cut. Place the cut dough into a greased pan. Before from heat and let cool before icing. Whisk together teaspoon of vanilla extract, 1 cup confectioners' sugar, and 2 tablespoons milk. Visit Berly’s Kitchen for original recipe and more great recipes and beautifully photographed food. These look amazing! I love cinnamon rolls. Probably one of my favorite things to eat. Oh I have no willpower around cinnamon rolls. Love the string idea! Try the floss! It works awesome! From the looks of things you had plenty of cinnamon with just the two tablespoons. This would drive everyone out of bed and to the kitchen. I think 2 tablespoons was a good amount of cinnamon. 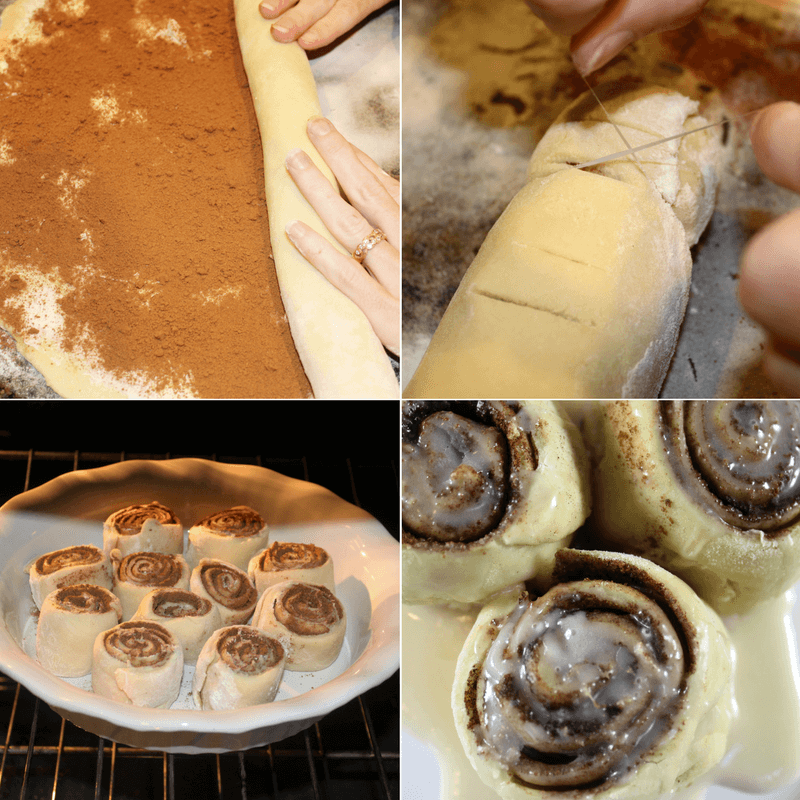 Oh I want REAL cinnamon rolls like this – my kids will never know that real rolls don’t come from a can. Lol. We make those kind occasionally too. The kiddos would love these.